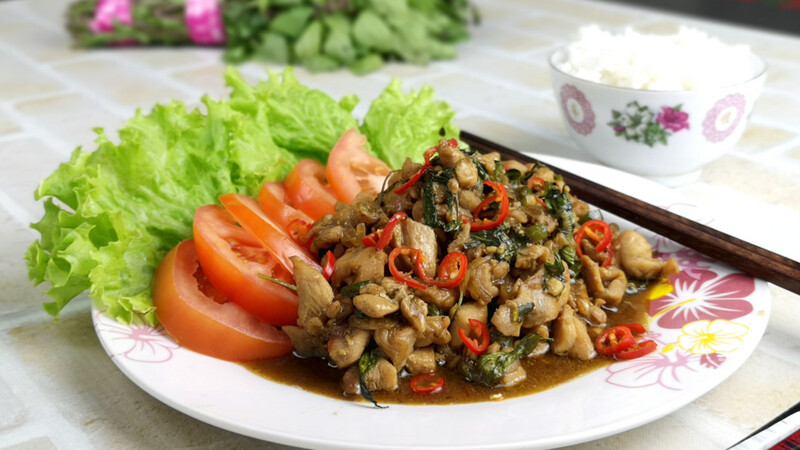 Thai basil chicken is known in Thai as pad kra pao gai (ผัดกระเพราไก่). It is delicious, with a deep savory flavor and hunger-inducing aroma. 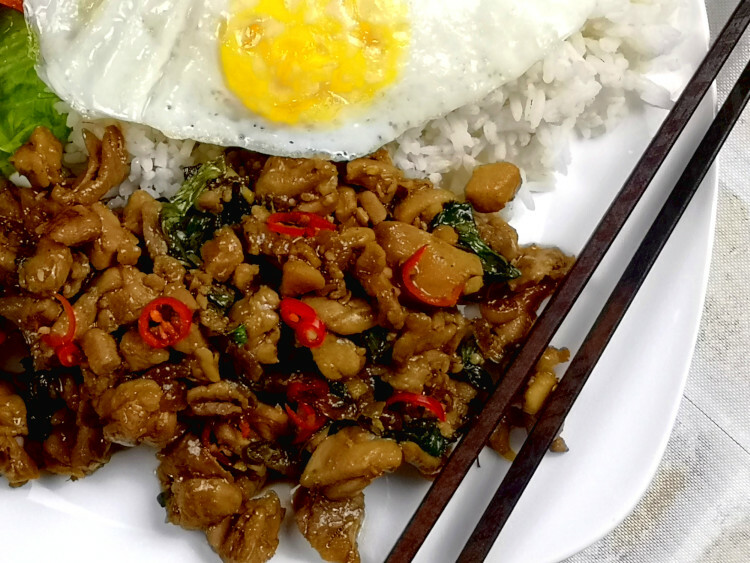 A favorite one-plate quick meal, Thai basil chicken, is simple to prepare, which is commonly served over a bed of steamed rice with an egg fried with plenty of oil (literally half deep-fried) until a crisp golden brown crust form at the side of the egg white. The cooking method is simple. What makes it so delicious is the combination of a list of ingredients with contrasting flavor. The ingredients are mostly available in most of the kitchen pantry, perhaps with one or two ‘exotic’ ingredients. As usual, I will explain the how to prepare this dish in detail and provide all the necessary information before summarising it in the recipe below. Note: This post may contain affiliate links. Please read my private policy for more info. I may receive commissions for purchases made through links in this post. 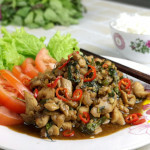 First, let’s look at the list of ingredients to prepare Thai basil chicken. This dish is best to prepare with boneless chicken, according to how it is done in Thailand. The meat can be cut the meat into small cubes or minced. I prefer small cubes as it has a better presentation and mouthfeel. The cubes should be small as it has a larger area to absorb the sauce. You can choose between breast or thigh meat. Many westerners are used to breast eat, which is excellent for this dish. However, we use thigh meat in our recipe, which is entirely our preference. Use Thai holy basil if you can get it. Unfortunately, Thai holy basin is not available in certain part of the world. In such case, you have to settle with the sweet basil or any basil you can get. Thai Basil leaves are used in this recipe. It can be quickly grown in the tropical weather over here. Use only the leave and discard the stems. Thai Basil Chicken is a very forgiving dish. You can vary the amount of basil. Add more than what is indicated in the recipe if you like the flavor. The seasoning plays the most crucial role in this dish, as it defied the typical Thai flavor that everyone from abroad will expect. 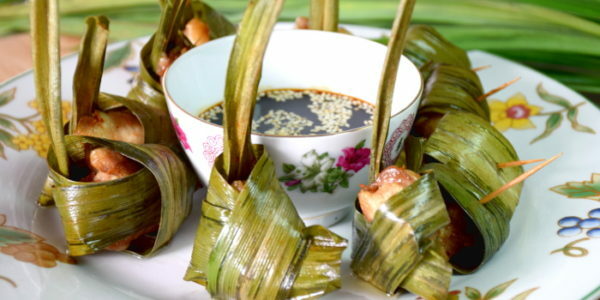 The main items are bird’s eye chili, soy sauce, fish sauce and sugar. The sauce should be stir-fry until nearly dry and glaze onto every morsel of food. This chicken will absorb the maximum amount of sauce achieve the concentrated flavor. It is not dish sits on a pool of sauce. I use the ABC brand sweet soy sauce made in Indonesia. It is the closest substitute for Thai soy sauce I can get at the local market. Another good replacement is Malaysia made dark caramel soy sauce. Fish sauce and soy sauce are both salty, but the flavor is different. The combination of both made the taste more wholesome. Some of the Thai brands are available online. Some chef only uses the soy and fish sauce. I prefer to add a small amount of oyster sauce, perhaps due to the influence of Chinese cooking. As such, I would say this is MY Thai basil chicken recipe, and will not claim that it is an authentic Thai recipe. Always use ground white pepper for Asian dishes unless it is stated otherwise. I can only think of some fusion Asian cuisine such as black pepper steak (Asian style) use black pepper instead of the white counterpart. Garlic and onions are both the aromatics to form the body of the sauce. Minced the garlic and cut the onion into thin slice. Saute in vegetable oil until aromatic before adding the remaining ingredients. Alternatively, grind the garlic, onion, and chili with the mortar and paste coarsely. (Or use a food processor for a large batch to keep for future use). Grinding enable the aromatics to release extra depth of flavor, which will make the dish more spicy and garlicky. As of the chili, Thai bird’s eye chili is the choice. This type of chili is very spicy, albeit of its small size. Thai people can take very hot food, and add plenty of chilies without removing the seeds. You can reduce the number of chilies if you are not used to the fiercely hot food. One way is to slit open the chili lengthwise. Discard the chili after stir-frying. If you want it to be spicier, clean the chilies, remove the stem and cut them into thin slices lengthwise, or grind it with the garlic to form a paste. Add some vegetable oil in the wok. Add some sliced onions into it and saute until soft. Do not add the garlic together with the onion because garlic tends to burn quickly. Add the garlic only after the onions turn slightly brown. Add the diced chicken and continued to stir-fry until the chicken meat is cooked. It may take about two to three minutes. So far the cooking process is relatively standard. Once you add the seasoning, you will start to smell the typical aroma of Thai street food drifting into your sitting room. Add the oyster sauce, sweet soy sauce, fish sauce, some sugar, and the bird’s eye chili at this stage. You can adjust the amount of chili according to your preference. The amount of chili in the recipe will yield moderately not cause, which is still considered mild for the locals. Do remember this is bird’s eye chili, which is small but is very spicy. 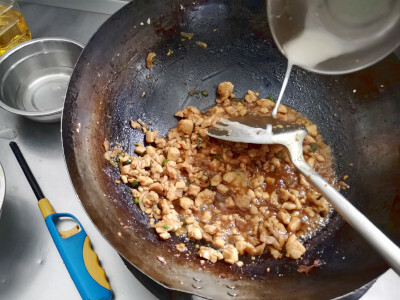 In the restaurant setting, we blend the garlic, onion, and chili, then cooked with vegetable oil and add the sugar, pepper, soy sauce, oyster sauce, and fish sauce to form a Thai basil chicken sauce, This is the trick in most of the restaurants to speed up the cooking process during peak hours. All we need to do is ladle the right amount of this premix sauce and add the diced chicken. The process is simplified without compromising the quality of the final dish. I do not marinate the chicken, although other chefs think otherwise. I had tried two different versions in the past. Marinate and deep-frying the chicken before cooking in the wok. I find out that there is no difference in taste whether to marinate or not. It just tastes the same. The chicken must be diced very small to have a larger surface to absorb the sauce. You also need to cook it for three to four minutes to let the chicken have time to absorb the flavor. That is why I add some water to the sauce and let it cook for a while. Oil blanching the diced chicken is supposed to give the chicken an additional aroma. However, the Thai sauce is very savory, which downplay the effect of oil blanching (deep-fried for a short while) to be insignificant. Add the cornflour slurry to thicken the sauce. The sauce should not be runny, but to cling on to the surface of every dice, to ensure you enjoy every bite is full of the unique flavor of Thai cuisine. Add the diced chicken and continued to stir-fry until the chicken meat is cooked. Add the oyster sauce, sweet soy sauce, fish sauce, some sugar, and the bird's eye chili at this stage. Add the basil leaves when the water is about to dry out. The basil needs only about half a minute to cook, and will quickly wilt and change to dark green. Once this happens, add some ground white pepper to season and dish out. 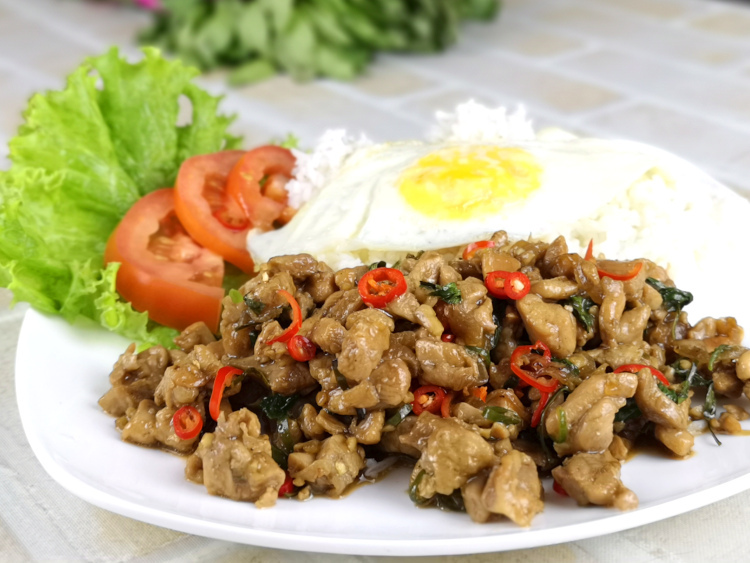 9 replies to "Thai Basil Chicken Recipe – How to cook (step-by-step instruction)"
I like the simplicity you put in your explanation and cooking style. I enjoy cooking and eating, so will be trying your style of cookin the Basil chicken. You are welcome, Sally. 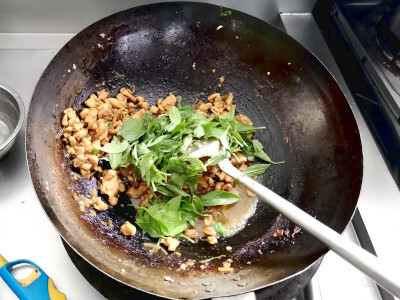 Basil chicken is what I like, and I wish you will enjoy cooking and eating it just like me. H KP, I have just watched your video and will certainly try to make the recipie. It looks delicious! Thank you for your compliment (my kitchen). Wish you will enjoy your basil chicken. You are welcome, Tina. Wish you all the best in cooking the Tahi basil chicken. Best recipe We’ve tried! Thai basil is my favorite! Thank you for trying out the recipe and so glad that you like the basil chicken.